Nerf Guns are made for fun and adventure of kids. Every child wants to play nerf battle with its friends. Younger kids should play with one handed small nerf blasters, while elder kids want powerful guns. When you are participating in a big nerf war, you must have a powerful nerf gun to destroy your enemies. Most Nerf Guns are powerful, but they also have some limitations. If you want to play a limitless nerf battle then you have reached the right place. Our team has worked hard to find out the best nerf machine gun for you to fight a long running battle. You should check out powerful nerf gun list and the decide which blaster is suitable for you to win the next nerf battle. Hasbro Inc. has categorized nerf guns in various types. For example: Nerf Zombie Strike Blasters are made for zombies v/s humans fighting battle. Nerf AccuStrike Blasters are designed for firing accurate shots. The same way, Nerf Automatic Guns are made to help your play big nerf war and destroy your enemies. Here we provide list of such powerful nerf blasters. Nerf Rampage Blaster is a powerful nerf gun with huge dart capacity. It comes with 25 Elite darts and a huge drum to hold all 25 darts in one time. It has one handle below the barrel so that you can hold the blaster properly. This handle is also useful to prime the blaster to get ready for firing action. You can shoot your enemies by unleashing the darts one by one or do rapid fire to kill all of them at once. The Rampage Blaster does not require batteries and it can fire the darts at up to 90 feet away. Nerf Infinus Blaster is a fully motorized blaster with 30 darts capacity. It contains a huge dart drum which is fixed at bottom of the blaster. You can load all 30 Elite darts at a time and fire them as quick as you want. It has speed load technology that allows you to reload darts without removing the drum from blaster. Just press the acceleration trigger to start the motor and pull the trigger to start firing the darts on your enemies. You have to insert 4 D batteries to use the Nerf Infinus Blaster. Nerf HyperFire Blaster is also a motorized nerf gun. But this blaster is able to fire five darts per second. When you have fresh batteries in HyperFire Blaster, you can unleash 5 Elite darts at your enemies. It requires 4 D batteries to power up the motor. The blaster comes with a big dart drum that hold 25 Elite darts at a time. You should keep extra darts to reload when the blaster gets empty in middle of the mission. When you fire the darts in burst fire mode, your enemies have no time to think, defend or fight back. All three nerf blasters given above are best to destroy your enemies. Out of these three guns, Nerf N-Strike Elite HyperFire is our favorite. You should choose the one which is convenient for you. Here You can find some most nerf gun reviews article to help find best nerf gun. Best Nerf Games for Kids: Nerf Guns are most popular and loved toy guns among kids. Every kid love to play with nerf gun. But the best use of nerf guns is done in the Nerf Battles which is also known as Nerf Games. There are various types of Nerf Games for different ages of kids and types of nerf guns. Nerf Games are played kids and teenagers at indoor as well as outdoor. Let us discuss each type of Nerf Games in detail. When you are the only kid with nerf gun, you should try playing Single Player Nerf Games. 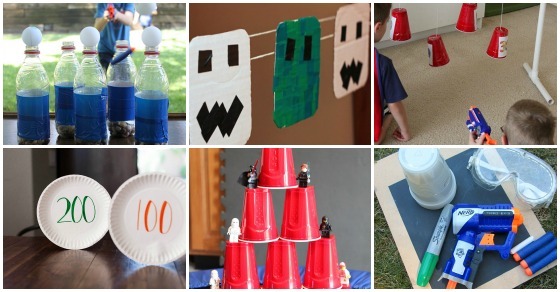 Such games include Tin Can Challenge, Paper Plate Targets, Ping Pong Ball Targets, File Folder Shooting Range, Swinging Glass Nerf Targets, Plastic Cup Shooting Game, Shoot the Bottles Game etc. Most One/Single Player Nerf Games can be played indoor as well as outdoor. A parent should help the kid to prepare the targets such as paper plates or plastic cup. Thereafter, you are ready to shoot the targets nerf game and have a lot of fun. You can check your shooting accuracy by firing the targets from short, medium and long distance. When you and your friend have nerf guns, you have more exciting games to play. Both of you have similar nerf blasters so that each kid get equal chance to attack and defend. Nerf One on One Battle is the Best Nerf Game for Two Players. You have to make some game rules and mutually agree to follow them during whole nerf game. This game can be easily played at indoor. You can also play it outdoor, but make sure the place is safe and you don't shoot someone who is not in the game. Nerf Battles Games are designed for Battlers playing as Teams. When you are more than three kids, make two teams of equal players to play two teams battle. You can play North v/s South Nerf Game, Capture the Flag Nerf War, Save the President and many others. North v/s South Nerf Game is played by creating two teams as North Team and South Team. One team has more players with small nerf guns, while other team has less players with big nerf guns. Each team has right to build bunkers and protection before the war begins. In this nerf game, both the teams are required to shoot other team players. The player who is shot, is out of the game. The team whose one or more players are alive till the end is winner. So, you can play so many indoor and outdoor games with nerf guns that we have discussed above. If you have some exciting nerf game ideas, feel free to share the same with us.